We’ve created a list of six things to consider while purchasing land. This list is not all encompassing but is a great start to your research. A quick internet search should result with the city or county’s zoning regulations. Pay special attention to reference the most updated regulations as they are subject to change. You can find Sevier County’s zoning regulations here. You will find restrictions in the legal description of the deed. These may either be in the body of the deed or attach as an appendix. Reach out to the county clerks office to access a copy of the deed. Some offices have online services. To determine if their are any utilities easements you can contact the utility companies; electric, gas, and telephone. A survey will also show utility easements. You can find property easements on file at the local assessor’s office. To confirm if you have access to city water or sewage, contact the city’s utility department. You can find information about utility access for land in Gatlinburg here. If you do not have access to city water or sewage, you will need to have a septic system installed and a well drilled to develop your land. We found this website to be a great resource for understanding the process of having a well installed. To install a septic system you must complete environmental testing. You will need a survey to determine the definite parameters of the land you are purchasing. A survey will show utility easements. If you need to install a septic system a percolation test will be conducted. Here you will find explanation about how to figure your tax bill in Tennessee from the Comptroller of the Treasury. To determine your tax liability you will need the appraised value, assessment ratio, assessed value, and the tax rate for your area. We hope you found this information helpful as you consider purchasing land. Please, visit our website to find lots and land listed in Sevier County, TN! Confidence in housing jumped in March in the Fannie Mae Home Purchase Sentiment Index® (HPSI), with the HPSI overall posting 88.3, 2.5 percentage points higher than one month prior and 3.8 percentage points higher than one year prior. The boost was fueled by homebuyers preparing for real estate season this spring, says Doug Duncan, chief economist and senior vice president at Fannie Mae. The amount of buyers who believe now is a good time to purchase leapt to 32 percent—a 10-percentage point surge. The amount of homeowners who believe now is a good time to sell shimmied up, as well, three percentage points to 39 percent. Across consumers, 42 percent believe home prices will rise, down three percentage points from one month prior. The HPSI is derived from Fannie Mae’s National Housing Survey® (NHS). Throughout this past year, we have seen both the national and local real estate markets continue to show slow, but steady, growth on the whole. As we look at the statistics for the Great Smoky Mountain real estate market through December of this past year, we will see that these trends, particularly in this real estate market, are largely holding steady, as we now begin into a new year. Let’s now see what the numbers have to say. In the category of Residences Sold, we see that in comparing December 2013 to that of December 2012, the number of residences sold held steady with an increase by 1% in terms of homes sold, in that 13 more homes were sold as of December 2013, as opposed to December 2012. This continues a trend of steadiness, and even very slight growth, in the real estate market as a whole, and as we look at the rest of the statistics, we will see that the market does indeed reflect a steady and slowly growing trend on balance, and we see that the market continues to show gradual, but steady, growth on the aggregate. 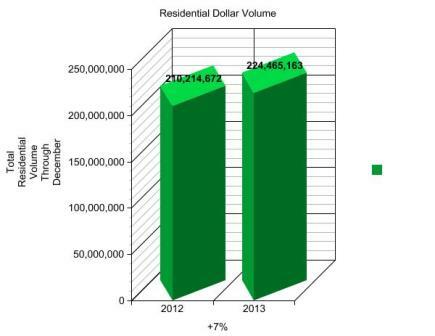 In the category of Residential Dollar Volume for the year, we see an increase of 7% through December of 2013, as opposed to through December in 2012. With the steadiness of the numbers as it relates to Residences Sold, the recent local and national trends of increasing home prices still continue to show that a greater dollar volume in homes are being sold, along with still continuing to show a slow and strengthening market reflective of greater confidence on the part of both buyers and sellers. There is also continued good news for sellers in the Average Sold Price Category. In line with statistics so far for the past year, prices still show a slow, but gradual, rise of 6% in December of this year versus that of December 2012, reflecting the recent local and national trends towards gradually higher home prices. As confidence continues to grow between potential buyers and sellers in the market as a whole, we see that the trend of higher home prices will likely continue for the foreseeable future. 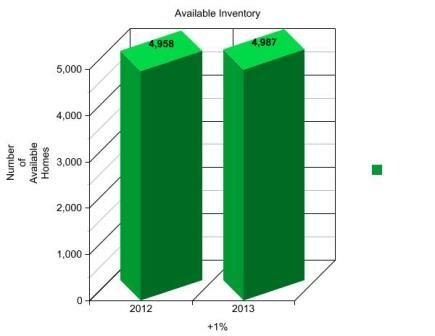 In addition, available homes on the market are actually increasing in terms of inventory. Through December 2013, as opposed to December 2012, there is a slight increase by 1% of homes being listed as available on the market, or an increase of 29 more available homes on the market, in December 2013, as opposed to December 2012. We see that higher home prices, as well as the very slight increases in homes being sold, may be contributing to more people wanting to place their homes on the market, thereby causing a slight increase in available housing inventory. While it is still too early to tell if the trend will continue into 2014, there are more available homes on the market in December 2013, as opposed to one year ago, which could further indicate greater confidence on the part of those wanting to place their homes on the market. As markets continue this gradual trend of growth locally and across the nation, these statistics, heading into 2014, are largely expected to remain steady, showing continued slow, but steady, strength and growth into the new year. Mortgage rates still remain at historically low rates, and there are still plenty of housing options to choose from, especially in the Great Smoky Mountain real estate market. Why not start your Great Smoky Mountain home search now by visiting our website, browsing our available properties, and seeing what the Smoky Mountain area has to offer for you? Let us help you make your home ownership dreams a reality today! As we head towards the end of 2013, and into the start of 2014, there are some noteworthy national trends in real estate that are worth watching. These primarily center on the increasing likelihood of rising mortgage interest rates, as well as the possibility of the Federal Reserve beginning to taper, or slow down, its long-running bond buyback program. Both trends could foretell significant changes in the real estate market nationally in 2014. In spite of these emerging trends, there are some other numbers worth noting in terms of the national real estate market that could also impact the coming year. One of these is that new home sales surged in October 2013 by 25% from the previous month, according to a report released by the U.S. Department of Commerce. According to Keith Gumbinger, Vice-President of the mortgage information site HSH Associates, “It may very well be that a lot of folks are feeling better about their prospects and buying a new home.” In addition, Gumbinger also stated that there has been a general ease of financing for buyers, as “builders are motivated to get folks into homes.” Finally, Gumbinger also said that inventories of existing homes are thin in several markets, prompting people to build new homes rather than buy old ones. The largest trend, however, in the coming year will center on the very real possibility of rising mortgage interest rates, especially since the Fed is currently weighing whether or not to start with tapering, or reducing the amount and scale to the Fed has been buying back bonds and securities since the 2008 financial crisis. The key to any real impacts will center on job and wage growth in the economy as a whole, and rising home prices will also have an impact as to whether or not there will be more buyers and sellers on the market in the coming year. At this point, it is too early to state how much of an impact this will have on the market, even though mortgage rates, from a more historical perspective, still remain low by comparison. In view of these emerging trends, as well as recent surges in both home prices and new home sales nationally, there has never been a better time to find the home of your dreams, right here in the Great Smoky Mountains! Please feel free to browse our available inventory of properties, and see the many varieties of properties that we currently have here in the Smokies! Let us help you realize your home ownership dreams today! For much of this year, we have seen both the national and local real estate markets continue to show slow, but steady, growth on the whole. As we look at the statistics for the Great Smoky Mountain real estate market through November of this year, we will see that these trends, particularly in this real estate market, are largely holding steady at the present time. Let’s now see what the numbers have to say. 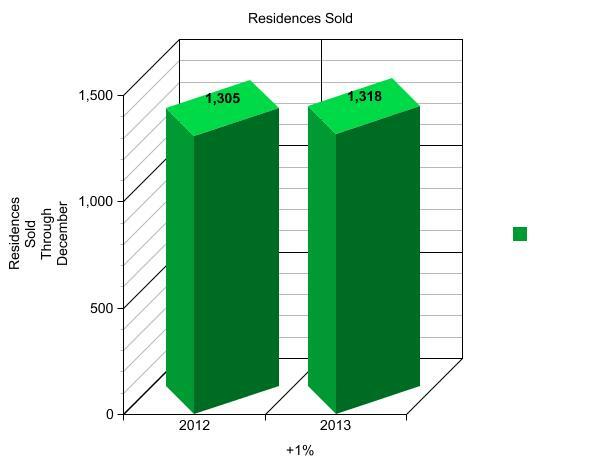 In the category of Residences Sold, we see that in comparing November 2013 to that of November 2012, the number of residences sold held steady with an increase by 1% in terms of homes sold, in that 16 more homes were sold as of November 2013, as opposed to November 2012. This continues a trend of steadiness, and even very slight growth, in the real estate market as a whole, and as we look at the rest of the statistics, we will see that the market does indeed reflect a steady and slowly growing trend on balance, and we see that the market continues to show gradual, but steady, growth on the aggregate. In the category of Residential Dollar Volume for the year, we see an increase of 5% through November of this year, as opposed to through November in 2012. With the steadiness of the numbers as it relates to Residences Sold, the recent local and national trends of increasing home prices still continue to show that a greater dollar volume in homes are being sold, along with still continuing to show a slow and strengthening market reflective of greater confidence on the part of both buyers and sellers. There is also continued good news for sellers in the Average Sold Price Category. In line with statistics so far for the year, prices still show a slow, but gradual, rise of 4% in November of this year versus that of November 2012, reflecting the recent local and national trends towards gradually higher home prices. As confidence continues to grow between potential buyers and sellers in the market as a whole, we see that the trend of higher home prices will likely continue for the foreseeable future. In addition, available homes on the market are actually increasing at the moment. Through November 2013, as opposed to November 2012, there is a slight increase by 1% of homes being listed as available on the market, or an increase of 51 available homes on the market, in November 2013, as opposed to November 2012. We see that higher home prices, as well as the very slight increases in homes being sold, may be contributing to more people wanting to place their homes on the market, thereby causing a slight increase in available housing inventory. While it is still too early to tell if the trend will continue, there are more available homes on the market in November 2013, as opposed to one year ago, which could further indicate greater confidence on the part of those wanting to place their homes on the market. As markets continue this gradual trend of growth locally and across the nation, home prices will continue their rise and housing inventory will continue to decrease. Mortgage rates still remain at historically low rates, and there are still plenty of housing options to choose from, especially in the Great Smoky Mountain real estate market. Why not start your Great Smoky Mountain home search now by visiting our website, browsing our available properties, and seeing what the Smoky Mountain area has to offer for your and home ownership dreams today? As home prices continue their gradual trend of rising during 2013, there are various investment tools that can be utilized by potential buyers and/or sellers in considering whether or not to invest in real estate, especially here in the Great Smoky Mountain real estate market. Today, we will focus on one of these investment tools, which has gained popularity in recent years, namely that of the self-directed IRA (Individual Retirement Account). A Self-directed Individual Retirement Account (IRA) is not your typical IRA since it allows the account owner to invest in a wider set of assets than those offered by custodians and trustees of traditional IRAs. This separates a Self-directed IRA from other types of IRAs since the account holder can decide what permissible investments to put his or her money into without having the custodian or trustee set a limit on what investments to pursue, hence the term “self-directed.” In other words, the account holder is limited only by the rules set by the Internal Revenue Service (IRS) and of course, his or her choice of investments. In addition, the custodian or trustee is also in charge of facilitating all other transactions that involve the Self-directed IRA. 1.) Having a Self-directed IRA allows an account holder to purchase properties anywhere that’s allowed by law. Almost every type of real estate is permissible such as residential and commercial property, real estate options, and the like. 2.) Purchasing property can also be done without paying all the required capital. For example, account holders can participate in a limited liability company (LLC) that directly invests in real estate. 3.) 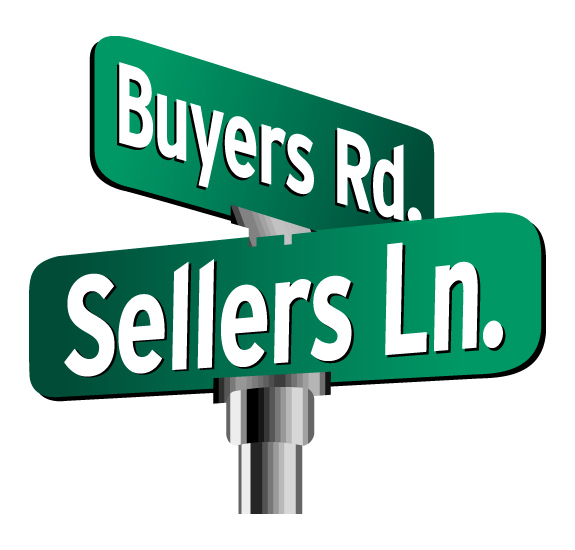 Many account holders have already taken advantage of the current buyers’ market where property prices are low and foreclosure rates are high. They can attest to how they’ve benefited from their diversified portfolio within their Self-directed IRA. 4.) Usually, real estate investments purchased within a Self-directed IRA are intended as long-term investments. This means that once an account holder buys a property, they will hold onto it until its value appreciates and is ready to be sold. In other words, the “buy-low, sell-high” concept is well suited for this type of IRA. 5.) Selling an IRA-owned home lets the owner avoid paying capital gains tax if the proceeds are rolled back into the IRA. This especially applies to those who rehab properties in rundown condition and flip them for quick profit. 1.) The Self-directed IRA cannot purchase real estate from a “disqualified person” either directly or indirectly. It also prohibits a “disqualified person” from using a property purchased within a Self-directed IRA. A “disqualified person” includes, but is not excluded to: Your spouse, your lineal ascendants/descendants and their spouses, plan fiduciaries (including advisors, custodians, and administrators), an entity (i.e., estate, corporation, etc.) where you own at least 50% of the voting stock, directly or indirectly, and anyone providing services to the plan. 2.) The purchased property cannot be used by the account holder – not even for a night. Only qualified people may use it and this does not include one’s relatives. Unless the account holder is 59 and a half years old and retired, then living in the investment property is deemed illegal. 3.) Account holders and family members cannot buy or sell property directly from their IRA. Likewise, it is also forbidden to buy or sell directly from the companies or enterprises that they own. 4.) Borrowing or lending money from the IRA is not allowed, and the IRA cannot be used to lend money to family members or as collateral for any type of loan. 5.) IRA funds and personal accounts cannot be combined or co-mingled. 6.) Those involved in the servicing of the Self-directed IRA account are not allowed to participate in any transaction that involves the account. With a Self-directed IRA, you will have to find a reliable custodian or trustee to open an account and comply with the IRS requirements, and set up the account with a bank or other financial institution. When an investment property has been selected, the account holder would then authorize the custodian to pay a deposit from the Self-directed IRA by signing an authorization form. After which, the account holder must complete the necessary documents and forward them to the custodian or trustee. 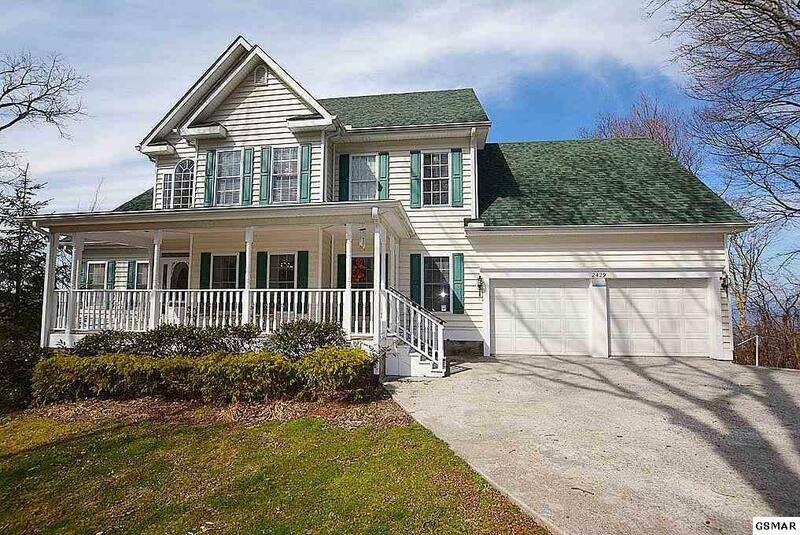 The closing agent will then coordinate the remainder of the transaction and release any additional funds required. Finally, Self-directed IRA’s, like any other investment in real estate, do involve a lot of risk. First, it is recommended that one invests only 25 percent at the most if you are not inclined to be a “risk taker.” With the prices of properties at their current levels, you can probably find one that you may like. Second, keep in mind that the Self-directed IRA is making the investment — not you or anyone else. You can’t simply take the cash flow that you earn from your investment property since the custodian or trustee is in charge of it through your IRA. Third, be sure to leave enough funds in your Self-directed IRA to cover unexpected expenses related to your property, such as tenant turnover, maintenance and repairs. This will put you in a safe position should you incur any “additional” costs. Finally, please always seek the advice of qualified real estate investment professionals that can help you find the properties that would be best suited for your overall retirement goals. Like anything else, always ask questions, and make sure to get as much as information as you can before using this investment tool, or any other investment tool, before deciding to act on it. With this basic knowledge and understanding of a potentially powerful investment tool for real estate, why not see what the Great Smoky Mountains real market can offer you today? Please feel free to browse our available properties, and let one of our buyer specialists help realize your home ownership dreams today! Come and see what the Great Smoky Mountains can offer you today! For much of this year, we have seen both the national and local real estate markets continue to show slow, but steady, growth on the whole. As we look at the statistics for the Great Smoky Mountain real estate market through October of this year, we will see that these trends, particularly in this real estate market, are continuing, even in spite of the recent government shutdown. Let’s now see what the numbers have to say. In the category of Residences Sold, we see that in comparing October 2013 to that of October 2012, the number of residences sold actually increased by 1% in terms of homes sold, in that 11 more homes were sold as of October 2013, as opposed to October 2012. This continues a trend of steadiness, and even very slight growth, in the real estate market as a whole, and as we look at the rest of the statistics, we will see that the market does indeed reflect a steady and slowly growing trend on balance, and we expect this to continue and improve over time. In the category of Residential Dollar Volume for the year, we actually see an increase of 6% through October of this year, as opposed to through October in 2012. With the steadiness of the numbers as it relates to Residences Sold, the recent local and national trends of increasing home prices continue to show that a greater dollar volume in homes are being sold, along with continuing to show a slow and strengthening market reflective of greater confidence on the part of both buyers and sellers. There is also continued good news for sellers in the Average Sold Price Category. In line with statistics so far for the year, prices still show a slow, but gradual, rise of 5% in October of this year versus that of October 2012, reflecting the recent local and national trends towards higher home prices. As inventory continues to decrease, we expect average home prices to continue their slow and gradual increase, in line with both national and local real estate market trends. In addition, available homes on the market are actually increasing at the moment. Through October 2013, as opposed to October 2012, there is an increase by 1% of homes being listed as available on the market, or an increase of 69 available homes on the market, in October 2013, as opposed to October 2012. We see that higher home prices, as well as the very slight increases in homes being sold, may be contributing to more people wanting to place their homes on the market, thereby causing a slight increase in available housing inventory. While it is too early to tell if the trend will continue, there are more available homes on the market in October 2013, as opposed to one year ago, which could indicate greater confidence on the part of those wanting to place their homes on the market. The enchanting, twinkling lights of Gatlinburg far below and majestic mountain vistas are what you’ll see from your own pristine 12 acre estate. Imagine having a 530,000 acre backyard! It is here that the Great Smoky Mountain National Park wraps around your very own unique, wildlife sanctuary. You can walk out your back door and in minutes be at Cataract Falls or stroll along the river into town. Perhaps, you might like instead to drive an easy mile from your 6000 square foot home into town for fine dining and entertainment, which you can do in minutes. All of this and so much more awaits your inspection of this incredible, one of a kind property. This 12 acre property has access to water and sewer lines for any possible future development. It features a level yard with an orchard of peach, cherry and plum and well as plenty of space for a garden. This mountain estate features three levels with four bedrooms plus numerous other rooms with plenty of room for dining and entertainment. It also includes a sauna, hot tub and gym. Totally remodeled and ready to be used as a residence, vacation rental, or retreat center. New hardwood flooring, new HVAC, new roof, new appliances, and new light fixtures. Additionally, two massive hand-crafted, wood burning stone fireplaces which feature the artistry of a master stone mason. The one in the main living area soars upward seventeen feet to the skylighted ceilings. Additionally there are two gas stone fireplaces, stone and slate patios, open sun deck, enclosed sun room, mature gardens, and several fenced acres for pets to create an environment that is truly one of kind. You’ll never find another unique place like this one! Especially, since it’s priced $100,000.00 below appraisal!!! Once this is grabbed up, there isn’t another one like it. So when might be the best time for you to see it? Give me a call at: 865-654-2121 . Right now, before it’s gone! On Wednesday, the Federal Reserve made the announcement that it would continue its long-running stimulus program of asset purchases and low interest rates. The Fed was widely expected to continue adding $85 billion a month to its portfolio of Treasury securities and mortgage-backed securities, particularly after the disruptive partial shutdown of the federal government in the first half of October. As a result of the Fed’s decision, the expectations are that short-term interest rates will remain low, at least for the immediate future. Fears about higher interest rates, especially on mortgages, have been on the rise since the Fed had also recently indicated a slowdown, or tapering, of its ongoing stimulus program. Fed officials had spent much of the summer preparing investors for a retreat from the bank’s stimulus campaign before the end of the year. That remains a possibility: The Fed’s policy-making committee is scheduled to meet for the final time this year in mid-December. However, no timetable or other decision on any tapering is expected from the Fed until at least mid-December, at the earliest. What does this all mean for you? 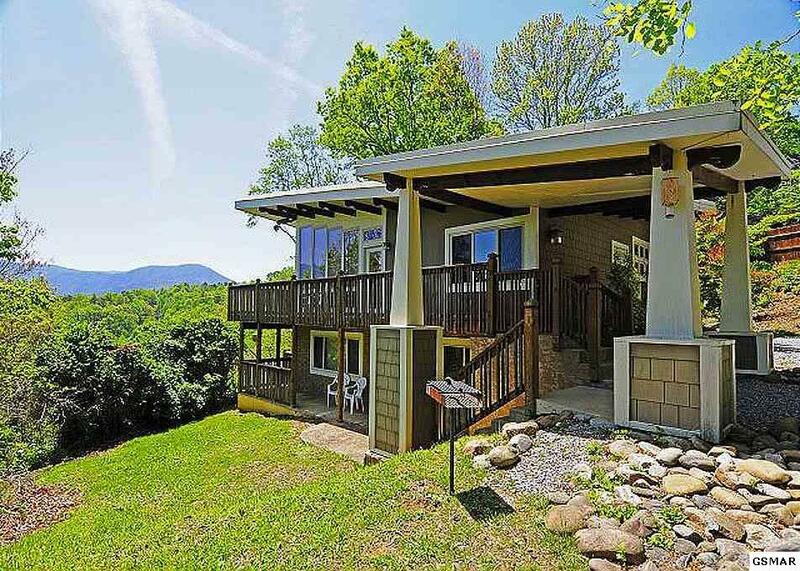 With low short-term interest rates still anticipated for at least the immediate future, there are many great deals and properties available here in the Great Smoky Mountains, with many types of homes and great deals still available! Please feel free to browse our available properties today, and let us help you find the home of your dreams! Existing-home sales increased in August and reached the highest level in six-and-a-half years, while the median price shows nine consecutive months of double-digit year-over-year increases, according to the National Association of Realtors (NAR). Total existing home sales, which include completed transactions for single-family homes, townhomes, condominiums, and co-ops, went up by 1.7% to a seasonally adjusted annual rate of 5.48 million units in August from that of 5.39 million units in July. 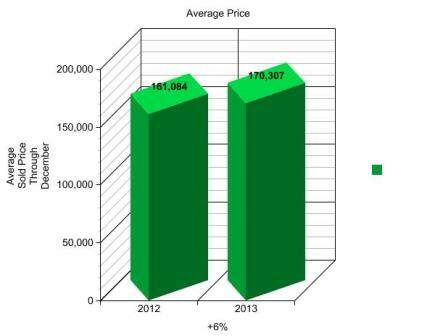 This is also 13.2% higher than the 4.84 million units sold in August 2012, one year prior to August 2013. Sales are at the highest pace since February 2007, when they hit 5.79 million, and have remained above year-ago levels for the past 26 months. According to Lawrence Yun, the chief economist for NAR, “rising mortgage interest rates pushed more buyers to close deals, but monthly sales are likely to be uneven in the months ahead from several market frictions.” These could include decreasing existing home inventories, as well as more restrictive lending standards, along with the potential for higher interest rates in the long-term. In addition, while it is unclear at this point, the ongoing government shutdown could also pose potential longer-term complications from agencies, such as FHA (Federal Housing Administration), the IRS, and others, being at least partially shutdown or closed all together. External pressures such as these also could have a longer-term impact on the market itself. What does this all mean for you? Right now, there are still many great properties available in the Great Smoky Mountains real market, and if you are interested in buying a new home, today is the best time for you to realize your dreams of home ownership. Please feel free to browse our available properties, and see what we can do to help you find a new home here in the Great Smoky Mountains today!